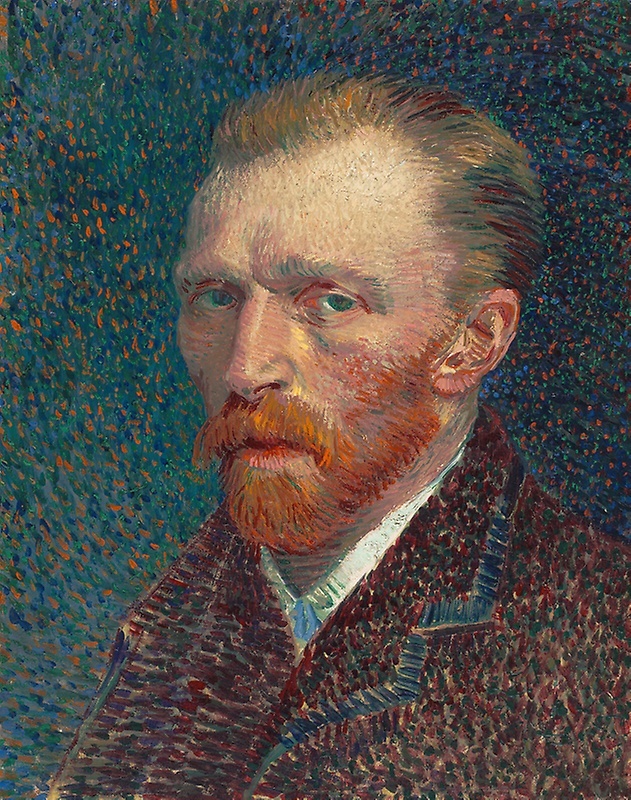 Vincent van Gogh painted forty self portraits during the remarkably short period that he pursued his passion for painting. Twenty four were painted during his two year stay in Paris between March 1886 and early 1888. This example was executed during the spring of 1887 when he was often accompanying Paul Signac on painting expeditions to the north-western suburbs of Paris and was experimenting with divisionist methods and Neo-Impressionist colour theories – as he explained in a letter to an English painter: ‘…seeking oppositions of blue with orange, red and green, yellow and violet.’ (see Applying Science to Art). To some extent Van Gogh was blazing a trail here as this is one of the first portraits to employ Neo-Impressionist methods. The orange points amid the background contribute to the scintillating surface while its dominant blue-green ground contrasts with the orange and red of his beard. But Van Gogh doesn’t confine himself to the dot or short dash of the Neo-Impressionist purists – his personal vision was too strong to bind him too strongly to their theories. Longer strokes are used for hair and beard as well as the modelling around his nose. One is perhaps tempted to read the introspective demeanour and haunting eyes seen here as a pointer to his inner turbulence and the tragic mental disintegration which would precipitate his suicide only three years later.